I landed in India at the city of Kochi – popularly known as the queen of Arabian Sea . And about an hour later , I delivered the Inaugural address for the international conference organized by the School of Management and Communications Studies . To my pleasant surprise , I was given a very warm traditional welcome by a group of beautiful ladies – who I later found out were top scoring business school students too . Beauty and Brains !!! My special thanks to the faculty , students and fellow speakers – it was an excellent experience for me , and such an honor . 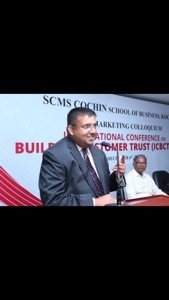 The theme was “building customer trust” – something that is very close to my heart . I had crowd sourced the keynote – and several friends gave me wonderful ideas on what this audience would like to hear. Judging by their reaction – I think the keynote was well received , and I am firmly convinced that crowd sourcing is the way to go for my future keynotes too. The quality of service and food in Indian hotels and restaurants never ceases to amaze me . Like last time , this time too I stayed at the Taj Vivanta at Whitefield. Exceptional experience – they have definitely acquired my loyalty and I look forward to next time . 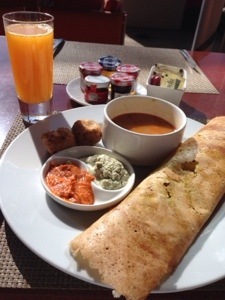 The photo below is what I got for breakfast – Masala Dosa and Bonda . And the state of India today is well represented by the fruit preserves kept on the table for folks who like a western breakfast . There is something for everyone here . Plenty of Japanese and Chinese options too . 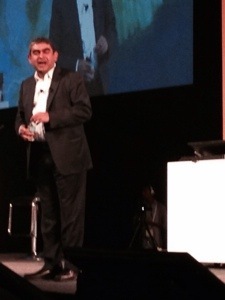 The highlight of the keynote was Vishal Sikka’s keynote – as always . 2. Try to cut down the length of time for the keynote to 60 minutes – or maybe 90 minutes at most . This is quite hard given the awesome content – but maybe more than one keynote at the event is the answer . 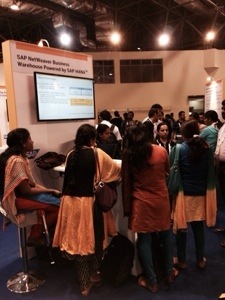 All parts of the SAP portfolio were well represented in the keynote – proving SAP is both a platform company AND an applications company . 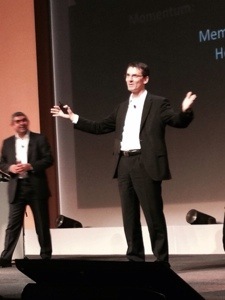 Hopefully the keynote from Bernd Leukert puts to bed the recurring questions on blogs whether SAP has moved away from apps business . All 3 are important first steps in their respective domains – and I am sure those teams are going to execute out of their skins to get all three to live up to their promise . 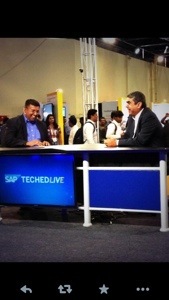 After his keynote , I got to interview Vishal on SAP teched live TV . The highlight for me in this interview was Vishal clearly articulating that BW on Hana is NOT something that is on a death bed . 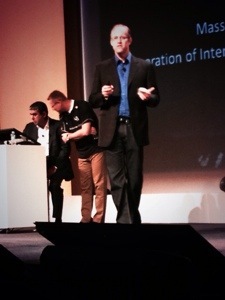 On the contrary, he explicitly called out SAP’s continuing investment in adding innovative capabilities to BW on Hana . We even have a brand new release coming out in few days – BW 7.40 . The BW on Hana pod never had anything less than three deep crowds – which makes me a very happy camper. Special thanks to the people who made it happen – Ingo , Rohit, Marcus and CAL team, Dan Kearnan , Bill R and marketing team, Praksh D, Daniel R and solution management team, Lothar H, Thomas Z, Klaus N , Stefan Sigg and all others from dev and product teams , and everyone else who came together to make this happen. I am incredibly proud to be a member of this amazing team. I also got to host a panel on the future of innovation in India . There is work to be done – but the panelists were upbeat on India’s ability to be an innovation powerhouse . Thanks Abesh , Kumud (also wish you a very long and happy married life) and Amit ! And then there was Failfare – learning how to fail fast and fail responsibly – my dear friend Marilyn Pratt’s brain child . Marilyn couldn’t make it to the event due to a personal emergency , but Jeanne Carboni did a fantastic job to back her up . I traded my speaking slot with a better speaker – my buddy Yariv Zur (we have a running contest on who is the bigger expert at failing) . Kumud and Jhansi were the other panelists and both were very good . I enjoyed listening to their experiences . Lucky did the emcee job to perfection . A huge shout out to Neel , Ravi, Rakesh, Joe, Gian , Abhijeet, Gansu and other colleagues who made Ganges a reality . 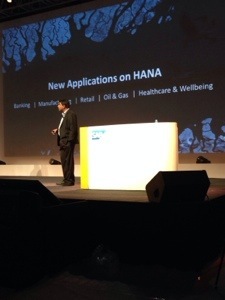 In the one year that I worked at SAP , there is only one project I liked as much as the BW on Hana trial that we did – that was Ganges . It is not every day that amazing technology gets used to fundamentally improve the life of common man – in this case, the mom and pop retail shops in India . You guys made the impossible possible . I am happy to have had a chance to be a cheerleader for you . Rock on guys ! 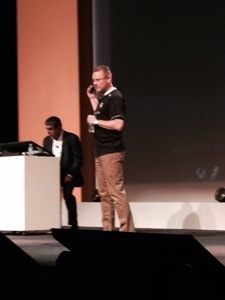 Goes without saying – a big part of the enjoyment of being at teched is hanging out with SAP mentors . It was a blast – thanks folks . Let’s keep those conversations going . Special shout out to Tammy Powlas for staying up late and attending our sessions remotely . Last but not least – HUGE thanks to Chip Rodgers , Margaret Laffan, Jason Lax , Maggie Fox, Mark Finnern, Andy Dey and other colleagues who made my first teched in India so memorable . I will be back ! Previous Did India socially regress by a couple of centuries in the last one week ? Excellent blog and recap Vijay! 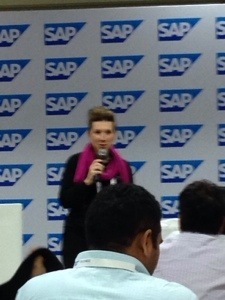 You’re always welcome at SAP TechEds (and D-Codes!). 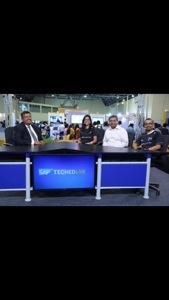 Thanks for your active support and engagement at TechEd Bangalore — and great job on your interview of Vishal. It’s really a classic with some great interaction and “quotables”. See you next time! Very nice blog with cool pictures and nice video links !! Saw you in tech-ed and would have dropped to say hi but you were interacting with some people. And then I didn’t see you after. May be would drop in next time if you are there.